I have an unsupervised classification dataset of a SPOT 6 image created in ERDAS IMAGINE and I now want to edit the class names in ArcGIS Desktop 10.2. I have done this successfully for a number of unsupervised classification datasets already, however the one I am currently working on will not allow me to edit. The file is an unsigned integer 8-bit raster TIFF file created in ERDAS IMAGINE. Browse other questions tagged arcgis-desktop raster arcgis-10.2 editing erdas-imagine or ask your own question. 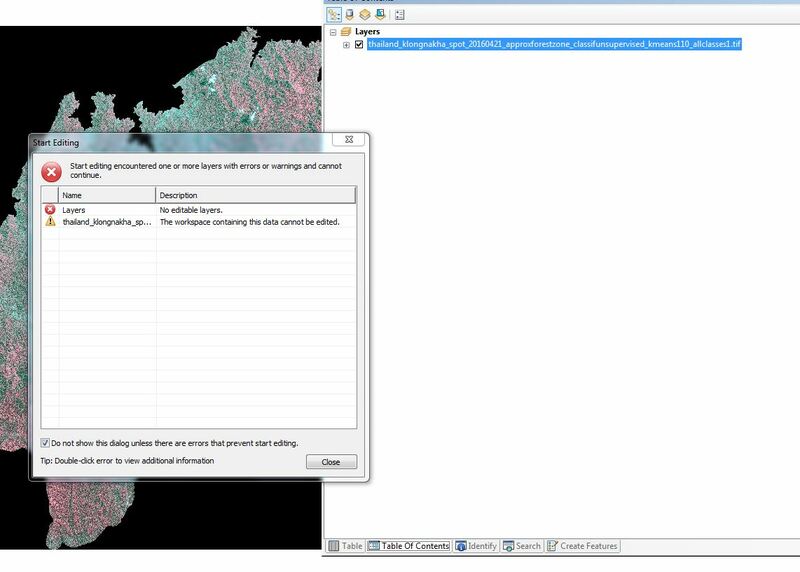 Manually editing raster to improve classification using ArcGIS Desktop? Editing relationship class in ArcGIS for Desktop? Tabular editing of feature layer in ArcGIS Online? Toolbar for Arcscan raster painting does not appear in edit session? Editing elevation in ArcGIS Desktop?